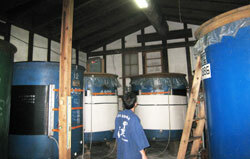 The water stored in this tank is used for brewing the nihonshu. 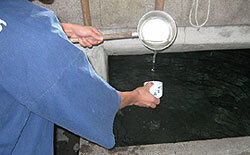 In the old days, nihonshu was brewed in areas that had access to clean, fresh water. However, with an increase of problems affecting the environment, many breweries are struggling to gain access to fresh water. Despite such difficult conditions in Japan these days, the Nakazen brewery sources its water locally from Mt. Ontake spring water – pure water that requires no distillation. Between the entrance of the shop and the old Mt. Ontake road lies a small locked wooden passageway. Behind it lies a 30 meter long pitch-black cave. The passage increasingly shrinks to the point that an adult would need to crouch on their knees to pass through. At the very end of the tunnel sits the Ontake Spring source well from which fresh water bubbles forth. 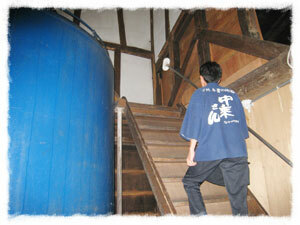 The water from this well is carried to the brewery to be used in making Nakanori-san Nihonshu. The water itself contains very few minerals and has a rich but clean and refreshing taste. Here we wash and soak the rice that will be used in brewing. First is washing. We use cold water to wash off the nuka (new-kah, or the fine powder left over from polishing) from the surface of the rice. Each type of nihonshu requires different levels of polishing. With the ginjoh (geen-joh), or high quality brews, the rice has been polished down about halfway. 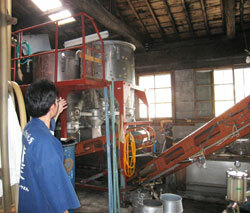 The recent trend in nihonshu brewing has been to use machines to wash the rice. 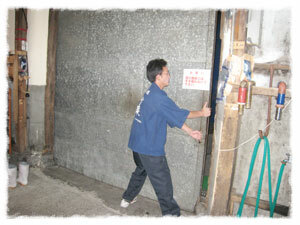 However, here at the Nakazen Brewery we wash all of the rice for our ginjoh brews by hand. We handle the rice as gently as we would a baby’s skin. Next is soaking. In this process we make sure that the water has permeated each grain of rice all the way to the center of the grain. The time it takes to soak through depends on the type of rice, its moisture content, the level of polishing, and the temperature of the water. The higher the ratio the polish is, the more quickly it absorbs the water. Since the higher-end polished rice takes such a short time, we have to measure the soaking period with a stopwatch. 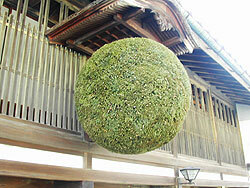 This large pot, called a koshiki (koh-she-key) is used to steam the rice. We fill the koshiki with about one ton of rice. Normally, with the rice we eat, we put it in the rice cooker, add water, and turn the switch on, but with nihonshu brewing we steam the rice in the koshiki*. Steaming the rice makes it easier for the koji (koh-gee; the microorganism used in nihonshu brewing) to culture on the rice. Rice that isn’t steamed lacks the ability to properly culture koji and lacks the punch that it brings to the brewing process. We steam the rice for about one hour. Our technique is to have the rice grains be hard on the outside but soft on the inside. *A Japanese rice cooker does not fully steam rice but rather cooks it through a mixture of boiling and steaming. Our fermentation tanks are made of enamel cast iron. 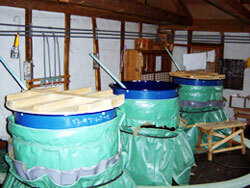 In the past, wooden casks were used, but at the start of the Showa Era (1926-1989) enamel tank technology was developed. 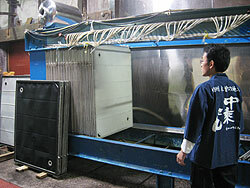 Currently almost all nihonshu breweries use either enamel cast iron or stainless steel tanks. In contrast to the wooden casks, not only are enamel cast iron tanks easier to maintain and sanitize, but they do not leave an unnecessary wooden taste and aroma in the moromi (moh-roh-me, the rice before it is filtered into nihonshu). There are three sets of numbers written on the tanks. The top number is the name of the tank. The second number is how many liters are stored in the tank. The third number is the date that it was licensed for use. Koji (koh-jee) is the microorganism that makes the magic of nihonshu brewing, soy sauce making, and miso production possible. This microorganism is unique to Japan and East Asia and plays a pivotal role in Japanese food culture. 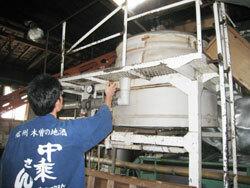 Koji is cultivated by mixing a starter with steamed rice and maintaining it in a controlled environment. We keep the koji culturing room at 30°C (86°F) and about 60% humidity, similar to a midsummer’s day. Since the old days, the process to make nihonshu has followed three steps. Nihonshu brewing begins with the difficult but all-important two-day process of making koji. First, we cool the steamed rice from the koshiki to a temperature of about 35°C (95°F) and then place it in the koji culturing room. We spread the rice on the floor and then cover it with the koji starter. We carefully massage the starter into the rice and then, to ensure even culturing, we mix and turn over the rice by hand – a process called kirikaeshi (key-ree-kai-she). After this, we carry out a two-stage process of temperature control. The stages are called nakashigoto (nah-kah-she-go-toe) which takes 7-8 hours and shimaishigoto (she-my-she-go-toe) which takes 6-7 hours. The finished koji has a silken beauty and carries a sweet chestnut aroma. This room is the yeast starter room. In Japanese it is called shubo (shoe-bow) with the characters 酒母 literally translating to the “nihonshu’s mother”. Yeast is a microorganism that takes sugar and transforms it into alcohol. Along with alcohol, this yeast also produces acidity, giving the finished product the refined aroma and taste that define nihonshu. We take great care in creating our starter and ensure that outside microorganisms do not enter the room. 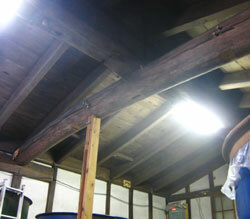 We make mizukoji (me-zoo-koh-jee) by placing water, koji, and yeast into the tank. Here we add the steamed rice which we have cooled down in advance. 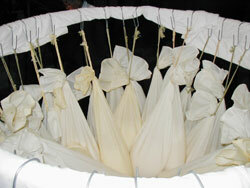 It can take us up to two weeks to produce a starter. This storehouse, made of mortar, has remained intact since the days it opened for brewing nihonshu. Just look at how magnificent this support beam is! 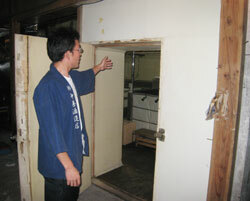 This storehouse is a precious treasure that the first generation brewer Nakazawa Zenkichi passed down. The mortar walls of the storehouse insulate the building, protecting it from drastic temperature changes brought in from the outside. 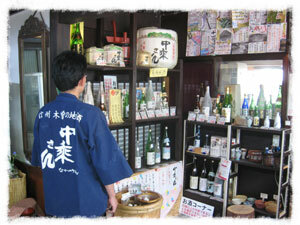 In summer, the temperature is a brisk 15°C (59°F), and in winter 5°C (41°C): temperatures suitable for brewing nihonshu. Once the koji and yeast starter have been prepared, it’s time to begin the actual process of alcohol fermentation. The general process of brewing nihonshu involves placing the yeast starter, the koji-cultured rice, the steamed rice, and the brewing water into the tank. We add these in three phases over a four-day period instead of adding them all at once. The first day is called soe (添 soh-eh – addition), where the first phase of yeast starter, brewing water, koji-cultured rice, and steamed rice – the base ingredients – are added to the tank. The second day is called odori (踊り oh-dough-ree – the dance). This is a day of rest in the process. We want to allow the yeast starter to rise in the mixture. The third day is called naka (仲 nah-kah – together). 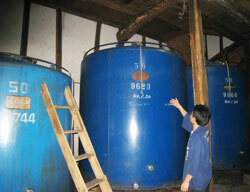 We first transfer the contents into the large tank. Then we add the second phase of the base ingredients into the mixture. On the fourth day we greatly increase the volume of the base ingredients. This third phase of adding ingredients is called tome (留 toe-meh – the stop). At this stage of the fermentation process, the mixture is called moromi (moe-row-me). As the yeast continues to ferment the ingredients into alcohol, the surface of the moromi gets covered in a layer of foam. This layer will then gradually get thicker and rise. We keep careful track of the state of the foam and aroma, as well as the levels of alcohol, sugar, and acidity in each tank and make slight adjustments to the temperatures as necessary. We press the moromi 30 days after the third phase of adding ingredients, the point at which the flavors have rounded out. We place the moromi in the filter press and separate the rice mash, called kasu (kah-sue), from the alcohol by applying pressure. When we check on the aroma and flavor of the freshly pressed nihonshu it is like the long anticipated moment of the birth of a child. The substance that sticks between the boards is called itakasu (ee-tah-kah-sue) and we market it during the winter. Itakasu can be cooked and eaten as is, or it can be put in soups and other recipes as well. In winter, we portion some of itakasu to be aged. We place it in a special tank and mature it until July. This aged variety of itakasu is called nerikasu (neh-ree-kah-sue) which we market as well. 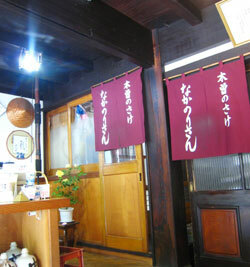 Nerikasu can be used as a base for pickled goods. We filter some varieties of nihonshu through special cloth sacks. 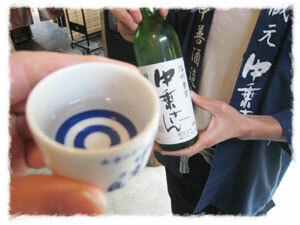 Drop by drop, this nihonshu gets filtered out by the natural flow of gravity. This process, called fukuroshibori (foo-coo-row she-bow-ree), requires a lot of time and effort. We place almost all of the freshly brewed nihonshu in the storehouse tanks to mature. We patiently wait to bottle the nihonshu as it rests in the tanks.